Any article on electronic music would be woefully incomplete if Pierre Schaeffer were omitted. He invented a new form of music in 1948 called musique concrete, which involved mixing together sound effects records via multiple turntables through a disc lathe–just before the tape recorder appeared–into abrupt collages of real-world noises. This 4-CD set is a comprehensive overview of his work from 1948 through the ’50s. Volume 1 “Les Incunables” contains the very beginning experiments from 1948-1950. The charming, crudely-recorded, archival crackle of “Cinq Etudes De Bruits” (1948) is comprised of trains, industrial knocking, whistles, repetitious sound “loops”, cut-up sounds, somber echoes, twirling lids and cans, diced vocal samples—years before these features would appear elsewhere. “Diapason Concertino” (1948) is a foray into piano music with strange, quiet rumbles and static. “Variations Sur Une Flut Mexicaine” (1949) is a brief work for Mexican flute; strange, twittering, dripping sounds; echo-knocks, plus frantic and mysterious tapping. “Suite Pour 14 Instruments” (1949) is a lenghty 25-minute piece full of damaged instrumental music with a small bit of concrète garble bandied about later on. “L’Oiseau RAI” (1950) closes the disc with odd-sounding bird calls and subtle, quiet tapping. 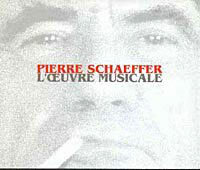 You are currently browsing the archives for the Pierre Schaeffer category.